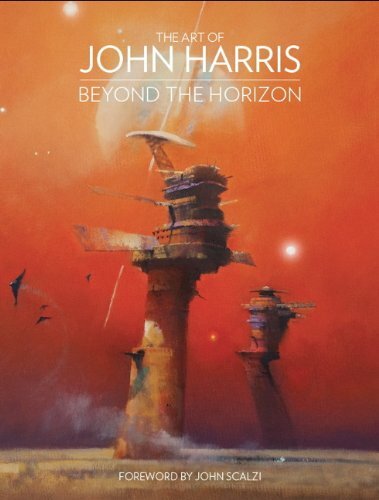 John Harris has been painting sci-fi art since the mid 1970s. His works are absolutely beautiful. I've seen a lot of sci-fi artbooks and nothing quite evokes the same kind of magical feeling that of a John Harris painting. I guess that's it, they have a very painterly feel to them as compared to digital paintings commonly seen nowadays. By painterly, I mean his masterly use of those hard and invisible edges. There are details where needed, and the less important bits are merely suggested. There's a very textural feel as he uses canvas, and it's wonderful to see how the colours work against the painting surface. Looking at his paintings, it's as if John Harris is painting plein air, or in this case plein space, in outer space from some space station or studio. The colours, design, composition are wonderful. I feel that the sense of scale is being conveyed very well. And the large size of the book makes the artworks look more majestic as well. The book's a 160-page hardcover. In addition to the sci-fi art, there's a section with paintings featuring an exotic location almost inspired by Asian architecture and his own imagination. The commentary is basically John Harris talking about his thought process, and some background to the worlds he paintings. Highly recommended to sci-fi art fans.